Bluetooth low energy (BLE) is one of most promising technologies to enable the Internet-of-Things (IoT) paradigm. The BLE neighbor discovery process (NDP) based on active scanning may be the core of multiple IoT applications in which a large and varying number of users/devices/tags must be detected in a short period of time. Minimizing the discovery latency and maximizing the number of devices that can be discovered in a limited time are challenging issues due to collisions between frames sent by advertisers and scanners. The mechanism for resolution of collisions between scanners has a great impact on the achieved performance, but backoff in NDP has been poorly studied so far. This paper includes a detailed analysis of backoff in NDP, identifies and studies the factors involved in the process, reveals the limitations and problems presented by the algorithm suggested by the specifications and proposes simple and practical adaptations on scanner functionality. They are easily compatible with the current definitions of the standard, which together with a new proposal for the backoff scheme, may significantly improve the discovery latencies and, thus, the probability of discovering a large number of devices in high density scenarios. ©2018 IEEE. Personal use of this material is permitted. Permission from IEEE must be obtained for all other uses, in any current or future media, including reprinting/republishing this material for advertising or promotional purposes, creating new collective works, for resale or redistribution to servers or lists, or reuse of any copyrighted component of this work in other works. 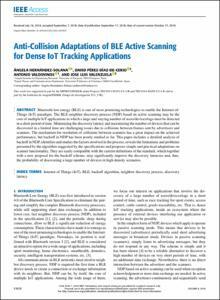 Hernandez, A., Perez-Diaz-de-Cerio, D., Valdovinos, A., Valenzuela, J. Anti-collision adaptations of BLE active scanning for dense IoT tracking applications. "IEEE access", 15 Setembre 2018, vol. 6, p. 53620-53637.